Speech analytics is not new; it has been around as long as the contact center. From the first customer service manager that wondered whether it was better to say, “What can I do for you today?” versus “How may I help you?” customer service has been shaped by a relentless pursuit of the perfect formula for positive customer interaction. In the early days, a customer service manager might spend time huddled over a recording of agents assisting customers, trying to sketch out basic data about how customers reacted to certain words or phrases, as well as how the tone of the agent impacted the results. Agents tacked mirrors above their stations, so they could easily see the smile that would produce a friendlier voice on the other end of the line. The expansion of data collection technology is creating new opportunities for customer service. From utilizing website behaviors to predict the products and services customers will need in the future to using order histories to set up automated deliveries, data insights are improving the customer experience. This, in turn, is making it easier for companies to determine what customers want and delivering it to them. Technology is fueling this growth of data insights because it provides organizations with the tools to collect, analyze, and gain a new perspective on customer data. As enterprises gather data on what behaviors and activities result in better customer interactions and produce higher-dollar sales tickets, companies are able to customize their services for personalized experiences for the customer. Speech analytics is the ability to measure, score, and provide feedback related to both sides of a customer service interaction. This occurs in real time, and it can evaluate what was said by the caller as well as the agent, along with the drivers or keywords that were important in how the call was scored according to performance metrics. The demand for this technology is growing quickly, with contact centers eager to access detailed information about how certain words and phrases can change the course of a conversation for either a positive or a negative outcome. Speech analytics works by using complex algorithms to convert spoken conversations into text. That text is then used to index words or phrases that can be used for analysis or ad-hoc searches. 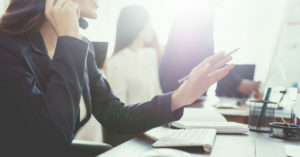 In addition, modeling can be used to examine the flow and technique of the contact center agent, establishing a better understanding of how the interaction should be scored. Speech analytics gives the agent greater insight into how to engage the customer when answering a service call and achieve the level of satisfaction the enterprise hopes to deliver to a customer. No matter how big or small the size of your contact center, it’s unlikely you have the resources to listen to each call and manually track the usage of particular words or phrases, then analyze how they impact the outcome of each call. That’s not even the full task since you would then need to take these insights and apply them in training with each agent. Improved sales conversion ratios: you’ll soon know which words or phrases are most closely linked with closing a sale, allowing you to train agents to include this kind of language to meet your sales goals. Reduction in customer churn: based on analyzing customer responses, you’ll have insight into how your customers define a positive experience, so you can consistently deliver that experience and build customer loyalty. Insight for product innovations: whether it’s measuring the number of negative mentions of a product, or specific “if only” statements that tell you what would make your product even better, you’ll gain important insights for product development from your customers. Increased opportunities: analytics provides opportunities to upsell or cross-sell based on data that helps you know the best ways to introduce new products or services to existing customers. One of the key benefits of speech analytics is the development of a well-trained, successful team of agents. Known for its high rate of turnover, contact center customer service can often feel too routine and mundane for agents to experience any excitement. As agents are trained in the fine details of successful customer service scripting, they can experience more success and excitement in their jobs. When incentives are built into the customer service goals, agents will have a better sense of their contribution to company goals and engage at a higher level with their jobs. To learn more about speech analytics and its impact on effective customer service, contact us at TelcoAlert. We look forward to helping you perfect your customer service with the right data collection tools.